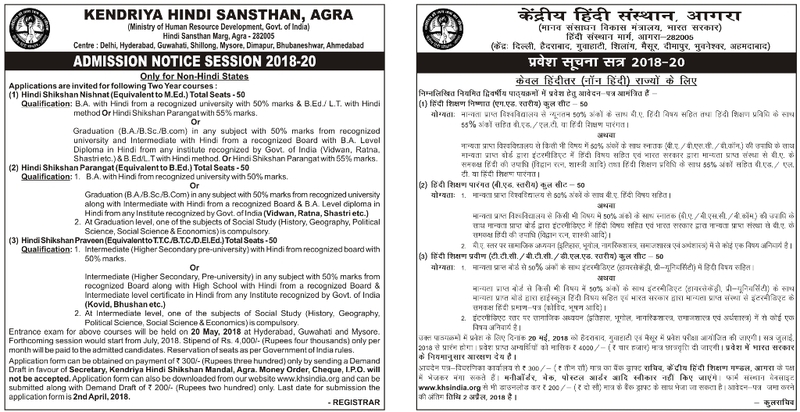 Kendriya Hindi Sansthan- KHS admissions for diploma programme in Agra. As applications are invited from eligible students to enroll for the admissions to one year hindi shikshan parangat (B.Ed. equivalent) programme for the upcoming academic year 2018. Course Name: Hindi Shikshan Parangat (B.Ed. Equivalent) Programme. Last date: 2nd April, 2018. Date of Entrance Exam: 20th May, 2018. Visit website @www.khsindia.org for more information on other courses in Kendriya Hindi Sansthan- KHS, Agra.